No matter what sport she played at Wooster High School from 1995-99 — volleyball in the fall, basketball in the winter and, her last two years, track in the spring — Sarah Baker, then known as Sarah Gordon, and success went hand-in-hand. 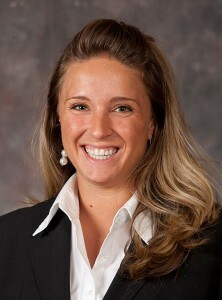 In volleyball, Baker, a three-year letterwinner, played in a pair of state tournaments and earned first-team All-Federal League and second-team All-Ohio honors in 1998. When she graduated, she was No. 2 in school history in kills for a season and career. Although only a two-year participant in track, she went out and set the school record in the discus, an event in which she finished 10th at the state track meet. As a basketball player in a program that dominated the Federal League in the 1990s, Baker came off the bench as a freshman on a team that finished as Div. I state runner-up. The next three seasons, Wooster reached regionals, and in three of her four years of basketball, the Generals were undefeated in the regular season. In her four seasons, Wooster never lost a Federal League contest. By the time her basketball days at WHS concluded, Baker was a two-time All-FL first-team selection, including the league’s Player of the Year in 1999, and she was a third-team All-Ohio pick as a junior and a second-team All-Ohioan as a senior. Following her selection as a Roy S. Bates Scholarship finalist, Baker ended up at Baldwin-Wallace, where she continued to play both volleyball and basketball. She was a two-time All-Ohio Athletic Conference second-team selection in volleyball, racking up over 1,000 career kills as an outside hitter, and in 2003 she was named first-team All-OAC in basketball. That year, she was also voted the Best Senior Female Athlete and Best Female Scholar Athlete at B-W, the first to win both awards in the same year. After graduation, Baker earned a Master’s degree from Akron and then obtained a law degree from The Ohio State University. Currently an attorney with Critchfield, Critchfield & Johnston in Wooster, she lives in her hometown with husband Charles Baker and their son, Wesley, with a new baby on the way.